Back in the 1920s and 1930s, manufacturing often meant enormous factories that tried to bring as many activities as possible under one roof--what economists call "vertical integration." However, the trend in recent decades has been toward "global value chains," in which production is not only divided up among a number of specialized facilities, but in additional those facilities are often located in different countries. João Amador and Filippo di Mauro have edited The Age of Global Value Chains: Maps and Policy Issues, a VoxEU.org ebook from the Centre for Economic Policy Research. The volume includes an introduction, 13 essays, and an appendix about data. Located a few miles south of Detroit at the confluence of the Rouge and Detroit Rivers, the original Rouge complex was a mile-and-a-half wide and more than a mile long. The multiplex of 93 buildings totaled 15,767,708 square feet of floor area crisscrossed by 120 miles of conveyors. There were ore docks, steel furnaces, coke ovens, rolling mills, glass furnaces and plate-glass rollers. Buildings included a tire-making plant, stamping plant, engine casting plant, frame and assembly plant, transmission plant, radiator plant, tool and die plant, and, at one time, even a paper mill. A massive power plant produced enough electricity to light a city the size of nearby Detroit, and a soybean conversion plant turned soybeans into plastic auto parts. The Rouge had its own railroad with 100 miles of track and 16 locomotives. A scheduled bus network and 15 miles of paved roads kept everything and everyone on the move. It was a city without residents. At its peak in the 1930s, more than 100,000 people worked at the Rouge. To accommodate them required a multi-station fire department, a modern police force, a fully staffed hospital and a maintenance crew 5,000 strong. One new car rolled off the line every 49 seconds. Each day, workers smelted more than 1,500 tons of iron and made 500 tons of glass, and every month 3,500 mop heads had to be replaced to keep the complex clean. The importance of GVCs has been steadily increasing in the last decades and, as reported in UNCTAD’s 2013 World Investment Report, about 60% of global trade consists of trade in intermediate goods and services, which are then incorporated at different stages of production. The shift to global value chains raises an array of questions from basic conceptual and measurement and conceptual issues to domestic and international policy. At the most basic level, global value chains challenge the standard ways of even talking about international trade as what one country imports from another. But some substantial portion of what, say, the US imports from China was actually imported into China, used to produce output, and then exported out of China. To put it another way, exports from a given country in a world with global value chains don't measure what was actually produced in that country. Measuring trade in terms of value-added between countries, not in terms of the value of what is shipped, can alter one's view of trade flows. For example, the essay by Arne J. Nagengast and Robert Stehrer provides a figure showing differences in trade flows between certain pairs of countries using the standard import and export statistics, and using statistics on value-added in exports and imports. As one example, the US trade deficit with China looks smaller and the trade deficit with Japan looks larger--because inputs from Japan are being exported to China, used in production, and then shipped to the US. 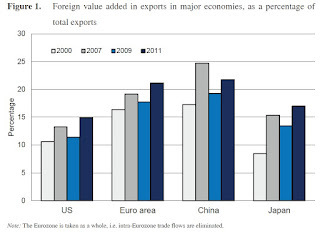 As the importance of global value chains rises, these divergences become bigger, too. argued that while the regional dimension has been strong in the past, "‘Factory World’ is emerging." They write: "Our analysis shows that value chains have become considerably more global in nature since 2003. Increasing shares of the value of a product are added outside the region to which the country-of-completion belongs. Regional blocs like ‘Factory Europe’ are still important, but the construction of ‘Factory World’ is progressing rapidly." The rise in global supply chains also has implications for countries looking for their niche in the global economy. The old-style approach was to focus on what your domestic chain of production and what your economy produced; the new-style approach is to focus on how your economy might fit into an international global value chain. The new emphasis means that connections to information and communication technology become even more important, because they are essential to managing far-flung production chains. Financial and legal institutions also matter more, because these sprawling production chains will require moving money and solving disputes in expeditious ways. It is a remarkable fact that the labor share of income in the United States hovered in the range of 60-65% of total income for 50 years--but has declined since 2000 and seems to be still falling. 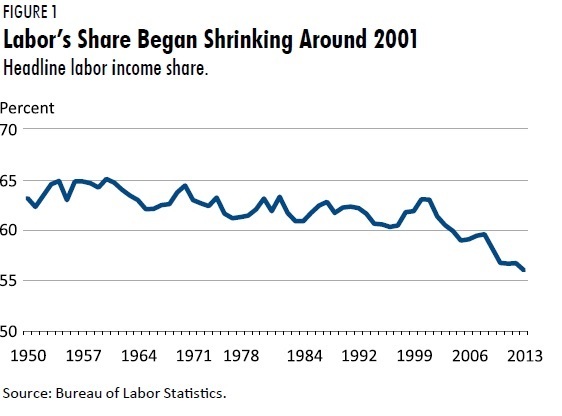 Roc Armenter explores how this figure is measured and some possible explanations for the recent change in "A Bit of a Miracle No More: The Decline of the Labor Share," published in the Business Review from the Philadelphia Federal Reserve (Third Quarter 2015, pp. 1-7). Indeed, until 2001, the BLS’s methodology assigned most of proprietor’s income to the labor share, a bit more than four-fifths of it. Since then, less than half of proprietor’s income has been classified as labor income. ... [A]t least one-third and possibly closer to half of the drop in the headline labor share is due to how the BLS treats proprietor’s income. 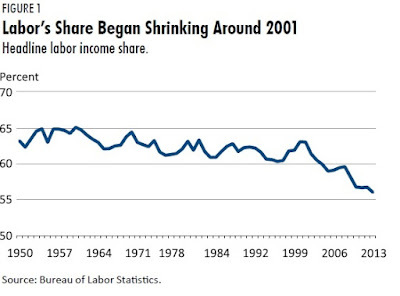 Before thinking about why the labor share has fallen, it's worth thinking about the remarkable fact that it didn't change for such a long time. After all, the period from 1950-2000 sees a rise in the share of workers in service industry jobs, along with enormous growth in industries like health care and financial services. 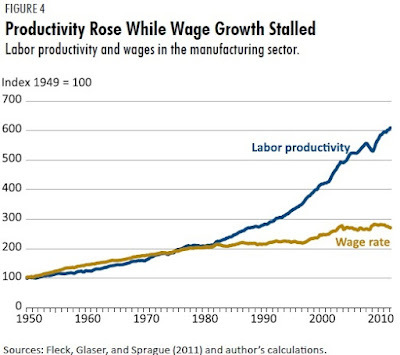 Surely, all of this should be expected to alter the labor share of income in one way or another? The reader would not be surprised to learn that different sectors use labor and capital in different proportions. In 1950, the manufacturing sector averaged a labor share of 62 percent, with some subsectors having even higher labor shares, such as durable goods manufacturing, with a labor share of 77 percent. Services instead relied more on capital and thus had lower labor shares: an average of 48 percent. Thus, from 1950 to 1987, the sector with a high labor share (manufacturing) was cut in half, while the sector with a low labor share (services) doubled. The aggregate labor share is, naturally, the weighted average across these sectors. 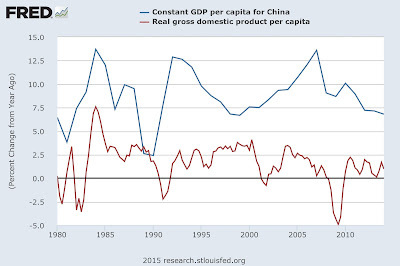 Therefore, we would have expected the aggregate labor share to fall. But as we already know, it did not. The reason is that, coincidentally with the shift from manufacturing to services, the labor share of the service sector rose sharply, from 48 percent in 1950 to 56 percent in 1987. Education and health services went from labor shares around 50 percent to the highest values in the whole economy, close to 84 percent. In manufacturing, the labor share was substantially more stable, increasing by less than 2 percentage points over the period. And this is the “bit of a miracle” — that the forces affecting the labor share across and within sectors just happened to cancel each other out over a period of almost half a century. We readily find out which part of the economy is behind the decline of the labor share once we look at the change in the labor share within manufacturing, which dropped almost 10 percentage points. Virtually all the major manufacturing subsectors saw their labor shares fall; for nondurable goods manufacturing it dropped from 62 percent to 40 percent. ... What ended the “miracle” was the precipitous decline in the labor share within manufacturing. This divergence between manufacturing productivity and wages started back in the 1980s, which seems a little early to match the timeline of the decline in labor share starting in 2000. However, one can cobble together a story in which the decline in labor share started in the late 1980s, was interrupted for a time by the white-hot and unsustainable labor market conditions during the dot-com boom of the late 1990s, and then continued on its path of decline. 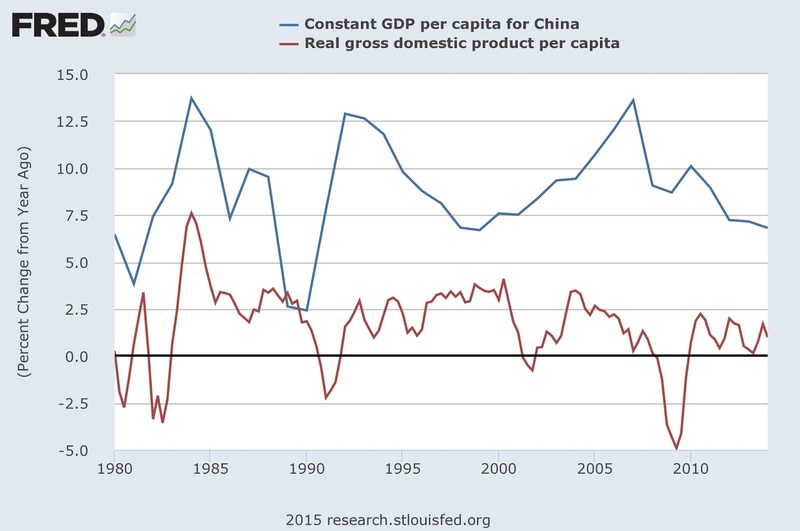 What caused the decline in labor share? Armenter runs through some possible explanations, while emphasizing that none of them are complete. For example, a "capital deepening" explanation holds that there is more capital in US manufacturing, which could explain lower income shares in manufacturing--but doesn't explain why wages in manufacturing stopped keeping up with productivity increases. A globalization explanation might help to explain this shift if the US was tending to import goods in industries that had high labor share and to export goods in industries with a lower labor share. But this factor doesn't seem able to explain the observed shift. as Armenter explains: "The main challenge to the hypothesis is that U.S. exports and imports are very similar in their factor composition. That is, were trade driving down the labor share, we would observe the U.S. importing goods that use a lot of labor and exporting goods that use a lot of capital. Instead, most international trade involves exchanging goods that are very similar, such as cars." An explanation not explicitly considered by Armenter, although it is in the spirit of the other explanations, comes from the work of Susan Houseman. She argues that most of what looks like productivity growth in manufacturing isn't about workers actually producing more, but is because computers have ever-greater capabilities--which the government statisticians measure as productivity growth. She also argues that there is a shift within the manufacturing sector toward importing less expensive inputs to production, which looks like a gain in productivity (that is, fewer inputs needed to produce a given level of output), but is really just cheaper imports of production inputs. In the spirit of half-full, half-empty analysis, I suppose the positive side of this analysis is that the drop in the share of US labor income is focused on only one part of the economy, and it's a part of the economy--manufacturing, which employs less than 10% of the US workforce (12.3 million jobs in manufacturing, compared to 148 million jobs in the entire US economy). Of course, the half-empty side is that no matter what the reason why the minor miracle of a fairly stable labor share has changed, it has in fact changed--and in a way that tends to disadvantage those who receive their income through labor. Perhaps the most famous metaphor defending the virtues of US federalism is that states can act as laboratories of democracy: that is, states can enact a range of policies, and can then learn from the experiences of other states. The phrase was coined by Justice Louis Brandeis in the 1932 Supreme Court case of New State Ice Co. v. Liebmann (285 U.S. 262). Brandeis wrote: "It is one of the happy incidents of the federal system that a single courageous state may, if its citizens choose, serve as a laboratory; and try novel social and economic experiments without risk to the rest of the country." But there's a hearty dash of irony here. Brandeis, however admirable his sentiments about the states as laboratories of democracy, was writing in dissent. In the specific case, the state of Oklahoma had passed a law that required approval from a state-level Corporation Commission for anyone who wanted to start a firm that would make, distribute, or sell ice. The law required that all existing ice-related firms be granted approval by the Corporation Commission to continue functioning: it was only new firms that were required to appear before the Corporation Commission and to argue against the incumbent firms that they should be allowed to begin operations. Thus, the question before the Supreme Court was whether the states, as laboratories of democracy, might ban entry into certain market. "Stated succinctly, a private corporation here seeks to prevent a competitor from entering the business of making and selling ice. It claims to be endowed with state authority to achieve this exclusion. There is no question now before us of any regulation by the state to protect the consuming public either with respect to conditions of manufacture and distribution or to insure purity of product or to prevent extortion. The control here asserted does not protect against monopoly, but tends to foster it. The aim is not to encourage competition, but to prevent it; not to regulate the business, but to preclude persons from engaging in it. There is no difference in principle between this case and the attempt of the dairyman under state authority to prevent another from keeping cows and selling milk on the ground that there are enough dairymen in the business; or to prevent a shoemaker from making or selling shoes because shoemakers already in that occupation can make and sell all the shoes that are needed. We are not able to see anything peculiar in the business here in question which distinguishes it from ordinary manufacture and production. ... It is not the case of a natural monopoly, or of an enterprise in its nature dependent upon the grant of public privileges. The particular requirement before us was evidently not imposed to prevent a practical monopoly of the business, since its tendency is quite to the contrary. Nor is it a case of the protection of natural resources. There is nothing in the product that we can perceive on which to rest a distinction, in respect of this attempted control, from other products in common use which enter into free competition, subject, of course, to reasonable regulations prescribed for the protection of the public and applied with appropriate impartiality. "And it is plain that unreasonable or arbitrary interference or restrictions cannot be saved from the condemnation of that amendment merely by calling them experimental. It is not necessary to challenge the authority of the states to indulge in experimental legislation; but it would be strange and unwarranted doctrine to hold that they may do so by enactments which transcend the limitations imposed upon them by the Federal Constitution." The business of supplying ice is not only a necessity, like that of supplying food or clothing or shelter, but the Legislature could also consider that it is one which lends itself peculiarly to monopoly. Characteristically the business is conducted in local plants with a market narrowly limited in area, and this for the reason that ice manufactured at a distance cannot effectively compete with a plant on the ground. In small towns and rural communities the duplication of plants, and in larger communities the duplication of delivery service, is wasteful and ultimately burdensome to consumers. At the same time the relative ease and cheapness with which an ice plant may be constructed exposes the industry to destructive and frequently ruinous competition. Competition in the industry tends to be destructive because ice plants have a determinate capacity, and inflexible fixed charges and operating costs, and because in a market of limited area the volume of sales is not readily expanded. Thus, the erection of a new plant in a locality already adequately served often causes managers to go to extremes in cutting prices in order to secure business. Trade journals and reports of association meetings of ice manufacturers bear ample witness to the hostility of the industry to such competition, and to its unremitting efforts, through trade associations, informal agreements, combination of delivery systems, and in particular through the consolidation of plants, to protect markets and prices against competition of any character. I'm not confident that Brandeis's economics is coherent. If it's true that large established firms in the ice industry have a huge cost advantage from economies of scale, then presumably they shouldn't have much to fear from smaller-scale competitors. In such a case, there might be an argument for regulating the price of ice as a monopoly. But smaller-scale competitors seeking to enter the industry would immediately face losses and have little chance of gaining market share. Industries looking for protection always claim that hobbling the competition would benefit consumers, and such claims were especially popular during the Great Depression, but there is ample reason to be skeptical of such self-interested claims. But more broadly, an open society can be viewed as having a number of laboratories. States can be one of the laboratories of democracy, along with cities, and the opportunities for experimentation within federal laws. Private firms and new entrants are the laboratories for methods of production, workplace rules and compensation, and new technologies. Public schools can be viewed as laboratories of education, while colleges and universities are also laboratories of education, as well as research. Media and publications can be viewed as laboratories for shaping social opinions and decisions. Social structures like families, communities, and churches can be viewed as a series of laboratories for other changes in social relations. In a constitutional democracy, government should face some limits when it seeks to shut down society's other laboratories. John Kenneth Galbraith (1908-2006) was trained as an economist, but in books like The Affluent Society (1958) and The New Industrial State (1967), he found his metier as a social critic. In these books and voluminous other writings, Galbraith didn't propose well-articulated economic theories, and carry out systematic empirical tests, but instead offered big-picture perspectives of the economy and society of his time. His policy advice was grindingly predictable: big and bigger doses of progressive liberalism, what he sometimes called "new socialism." For a sense of how mainstream and Democratic-leaning economists of the time dismissed Galbraith's work, classic example is this scathing-and-smiling review of The New Industrial State by Robert Solow in the Fall 1967 issue of The Public Interest. Galbreath's response appears in the same issue. Connoisseurs of academic blood sports will enjoy the exchange. "All writers know that on some golden mornings they are touched by the wand — are on intimate terms with poetry and cosmic truth. I have experienced those moments myself. Their lesson is simple: It's a total illusion. And the danger in the illusion is that you will wait for those moments. Such is the horror of having to face the typewriter that you will spend all your time waiting. I am persuaded that most writers, like most shoemakers, are about as good one day as the next (a point which Trollope made), hangovers apart. The difference is the result of euphoria, alcohol, or imagination. The meaning is that one had better go to his or her typewriter every morning and stay there regardless of the seeming result. It will be much the same. ..."
"My advice to those eager students in California would be, "Do not wait for the golden moment. It may well be worse." I would also warn against the flocking tendency of writers and its use as a cover for idleness. It helps greatly in the avoidance of work to be in the company of others who are also waiting for the golden moment. The best place to write is by yourself, because writing becomes an escape from the terrible boredom of your own personality. It's the reason that for years I've favored Switzerland, where I look at the telephone and yearn to hear it ring. ..."
"There may be inspired writers for whom the first draft is just right. But anyone who is not certifiably a Milton had better assume that the first draft is a very primitive thing. The reason is simple: Writing is difficult work. Ralph Paine, who managed Fortune in my time, used to say that anyone who said writing was easy was either a bad writer or an unregenerate liar. Thinking, as Voltaire avowed, is also a very tedious thing which men—or women—will do anything to avoid. So all first drafts are deeply flawed by the need to combine composition with thought. Each later draft is less demanding in this regard. Hence the writing can be better. There does come a time when revision is for the sake of change—when one has become so bored with the words that anything that is different looks better. But even then it may be better. ..."
"Next, I would want to tell my students of a point strongly pressed, if my memory serves, by Shaw. He once said that as he grew older, he became less and less interested in theory, more and more interested in information. The temptation in writing is just the reverse. Nothing is so hard to come by as a new and interesting fact. Nothing is so easy on the feet as a generalization. I now pick up magazines and leaf through them looking for articles that are rich with facts; I do not care much what they are. Richly evocative and deeply percipient theory I avoid. It leaves me cold unless I am the author of it. ..."
"In the case of economics there are no important propositions that cannot be stated in plain language. Qualifications and refinements are numerous and of great technical complexity. These are important for separating the good students from the dolts. But in economics the refinements rarely, if ever, modify the essential and practical point. The writer who seeks to be intelligible needs to be right; he must be challenged if his argument leads to an erroneous conclusion and especially if it leads to the wrong action. But he can safely dismiss the charge that he has made the subject too easy. The truth is not difficult. Complexity and obscurity have professional value—they are the academic equivalents of apprenticeship rules in the building trades. They exclude the outsiders, keep down the competition, preserve the image of a privileged or priestly class. The man who makes things clear is a scab. He is criticized less for his clarity than for his treachery. "Additionally, and especially in the social sciences, much unclear writing is based on unclear or incomplete thought. It is possible with safety to be technically obscure about something you haven't thought out. It is impossible to be wholly clear on something you do not understand. Clarity thus exposes flaws in the thought. The person who undertakes to make difficult matters clear is infringing on the sovereign right of numerous economists, sociologists, and political scientists to make bad writing the disguise for sloppy, imprecise, or incomplete thought. One can understand the resulting anger." The potent benefits of human milk are such that all preterm infants should receive human milk. ... Mother’s own milk, fresh or frozen, should be the primary diet, and it should be fortified appropriately for the infant born weighing less than 1.5 kg. If mother’s own milk is unavailable despite significant lactation support, pasteurized donor milk should be used. The demand then continues with a belief that human milk might have properties that are useful to adults as well. Some biomedical companies are involved in research, and there is apparently a subculture of bodybuilders who believe that consuming human milk helps them build muscle. What are the sources of supply to meet this demand? One source is donations that happen though the 19 locations of the Human Milk Banking Association of North America, as well as other donor organizations. But there are also for-profit companies emerging like Prolacta Bioscience and International Milk Bank which buy breast-milk, screen and test it, sometimes add additional nutrients, and then sells it to hospitals. There are also websites that facilitate buying and selling breast-milk. This market is one where prices are fairly clear: the for-profit companies typically offer moms $1.50- $2 per ounce for breast milk, and end up selling it to hospitals for roughly $4 per ounce. Quantities are less clear, although for a rough sense, the nonprofit Human Milk Banking Association of North America dispensed 3.1 million ounces of breast milk in 2013, while a single for-profit firm, Prolacta, plans to process 3.4 million ounces this year. Many people have a gut-level reaction that human breast milk for neonatal children is the sort of product that should be run on the basis of donations. But two concerns arise here, as enunciated by Julie P. Smith in "Market, breastfeeding and trade in mother's milk," which appears earlier this year in the International Breastfeeding Journal (10:9). As Smith writes: "Human milk is being bought and sold. Commodifying and marketing human milk and breastfeeding risk reinforcing social and gender economic inequities. Yet there are potential benefits for breastfeeding, and some of the world’s poorest women might profit. How can we improve on the present situation where everyone except the woman who donates her milk benefits?" There are a number of ideas to unpack here. First, a substantially expanded supply of breast-milk would improve the health prospects of pre-term infants. Donated breast-milk doesn't seem able to fill the need. Second, it's not clear why mothers should be expected to pump, save and donate breast milk for free, when the rest of the health care system is getting paid. In some practical sense, the social choice may come to paying the health care system to address the sicknesses that infants experience from a lack of breast milk, or paying mothers for breast milk. [W]e are writing to you in the spirit of open dialogue about your company’s recent attempts to recruit African-American and low-income women in Detroit to sell their breast milk to your company, Medolac Laboratories. We are troubled by your targeting of African-American mothers, and your focus on Detroit in particular. We are concerned that this initiative has neither thoroughly factored in the historical context of milk sharing nor the complex social and economic challenges facing Detroit families. ... Around the country, African-American women face unique economic hardships, and this is no less true in our city. In addition, African American women have been impacted traumatically by historical commodification of our bodies. Given the economic incentives, we are deeply concerned that women will be coerced into diverting milk that they would otherwise feed their own babies. Medolac withdrew its proposal. Without getting into the language of the letter ("commodification" and "coercion" are not being used in the sense of an economics class), the basic public health question remains: Given the very substantial health benefits of breast milk for infants, can it make sense to offer mothers a financial incentive to sell their breast milk? Especially knowing that this incentive will have greater weight for mothers in lower income groups? ‘The market’ fails to protect breastfeeding, because market prices give the wrong signals. An economic approach to the problem of premature weaning from optimal breastfeeding may help prioritise global maternity protection as the foundation for sustainable development of human capital and labour productivity. It would remove fiscal subsidies for breast milk substitutes, tax their sale to recoup health system costs, and penalise their free supply, promotion and distribution. By removing widespread incentives for premature weaning, the resources would be available for the world to invest more in breastfeeding. Finally, in an internet-based economy that excels at connecting decentralized suppliers and buyers, there is no chance that the paid market for breast milk is going away/ At least some of the market--say, the demand from body-builders--is likely to remain shadowy. But for neonatal infants and research purposes, it is useful for the bulk of the breast-milke market to come out of the shadows so that it can be subject to basic regulations, assuring that the breast milk isn't adulterated by cow's milk, microbes, or worse. If you'd like another example of the potential for economic markets in bodily fluids, I discuss the arguments concerning how to increase the supply of blood in "Volunteers for Blood, Paying for Plasma" (May 16, 2014). A proposal for using the recently dead as a source of blood donations is here. For 20 years, Mary Meeker--now of the venture capital firm Kleiner, Perkins, Caufield and Byers--has been presenting an annual overview of Internet trends that has become semi-legendary in the industry. 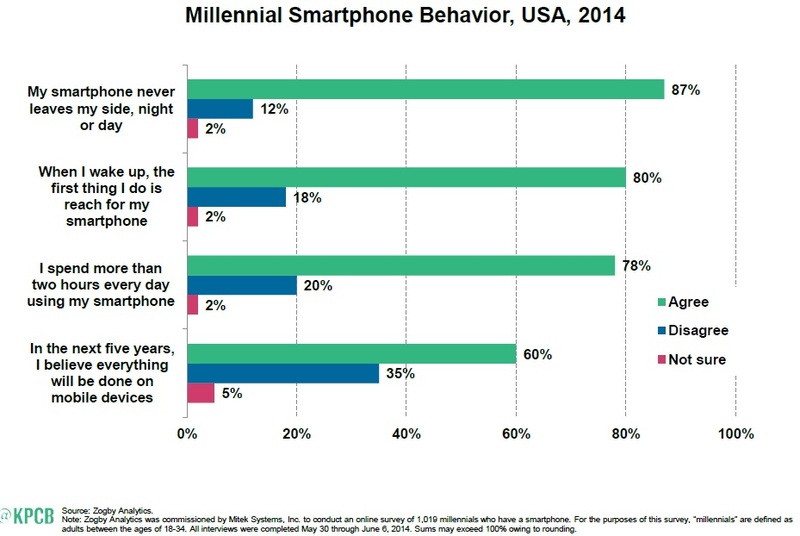 If you'd like to listen to a speaker go through 196 Powerpoint slides in 25 minutes, the link to her presentation at the Internet Trends 2015--Code Conference on May 27, 2015 is here. If you just want the slides they are here. For those who like taking a drink from a fire hose of information, this presentation is for you. 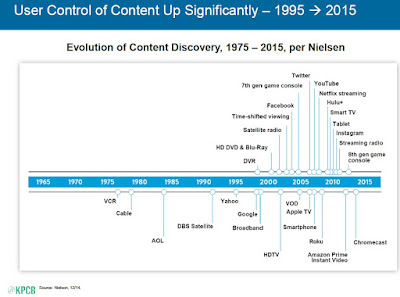 Here, I'll just pass along a few slides that particularly caught my eye, on the general theme of how our interaction with media is evolving. The old model is about turning a station on or off, or going to a certain website to read what's there. The new model is toward greater interactivity. 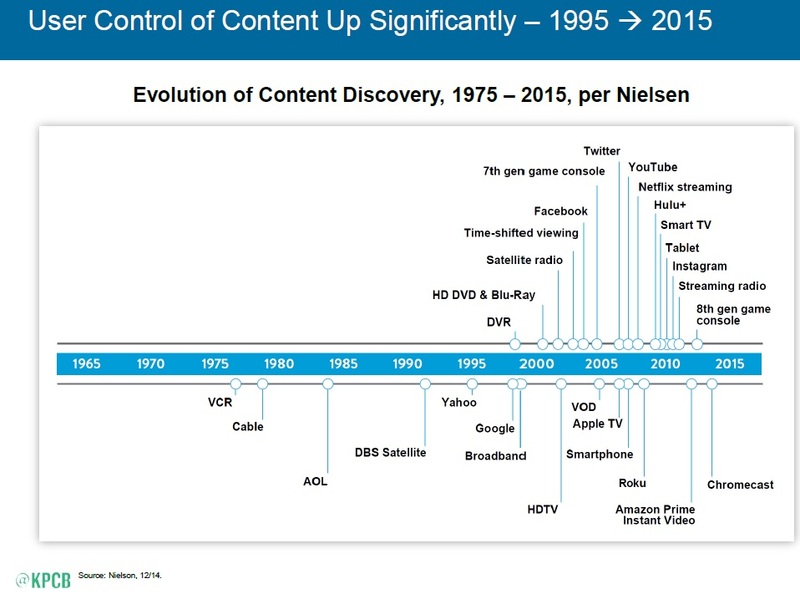 For example, here's a figuring that starts with the VCR and cable television back in the 1970s, as way in which users began to exercise more control over media, and points to the many ways in which this trend has expanded. Of course, this change has now gone well beyond the ability to choose which movie to watch. Interactivity involves both individuals posting content, and looking at content posted by others. 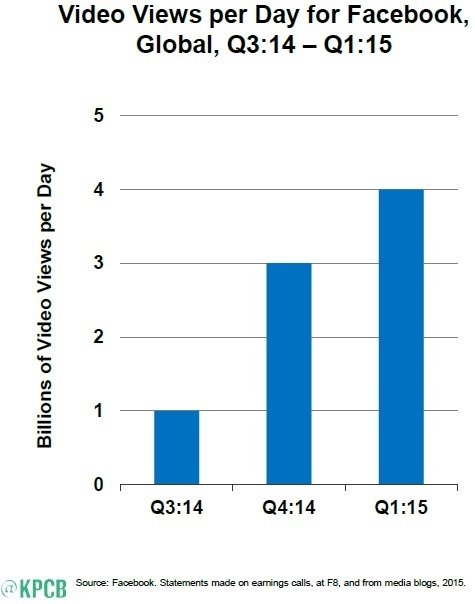 For example, YouTube reports that 300 hours of video are uploaded to the site every minute, Meeker offers a graph showing that Facebook is now up to 4 billion video views per day. 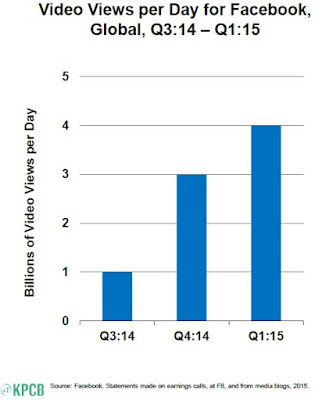 Of course, this use of media isn't just about watching cat videos. 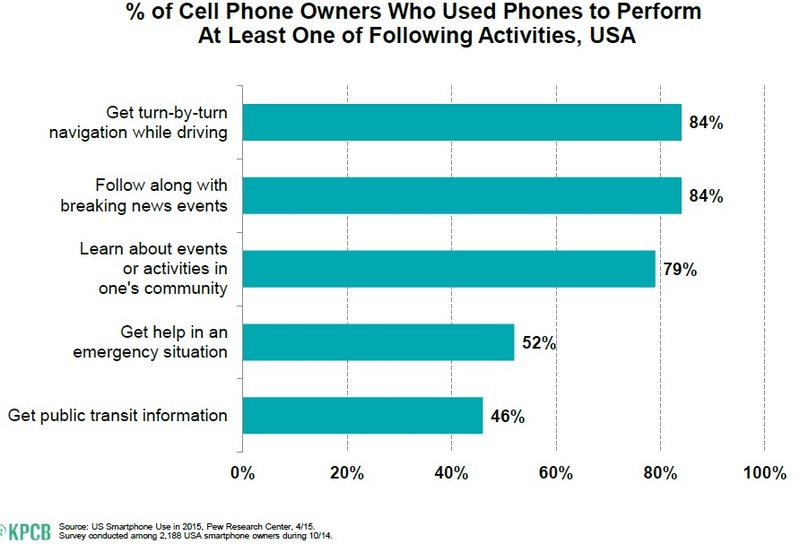 It's more and more using mobile devices like smartphones or tablets for many purposes: news, directions, events, and more. 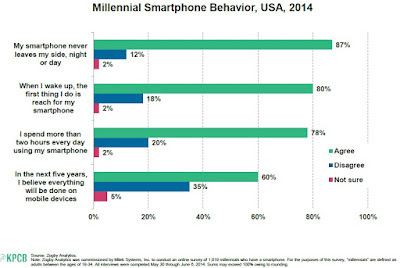 Indeed, many of the "millenials" in the 18-34 age bracket are umbilically attached to their smartphones. 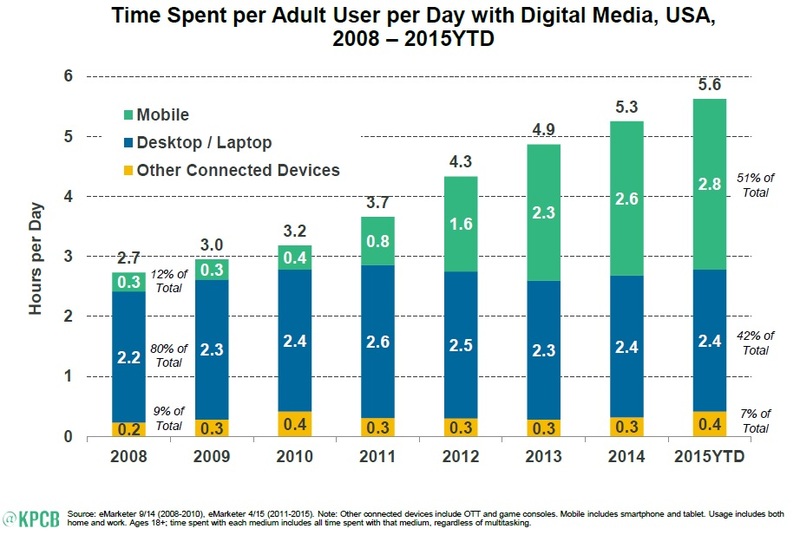 The upshot of these kinds of changes is a rapid growth in the time spent each day using digital media---expecially with mobile connections. 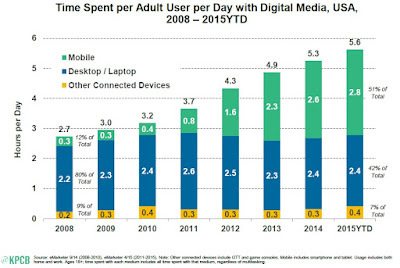 US adults are now up to more than five hours a day with digital media, double the level of seven years ago. [C]ertain kinds of flexibility have become more prevalent since 2008, particularly flexibility with regard to time and place during the day, making it possible for workers to attend to personal or family needs. On the other side, flexibility can be a backdoor for employers to extract more effort from employees with an expectation that they always be accessible. ... Also, flexibility can often mean variable pay. The use of temp and contract workers in the “on-demand” economy (also known as contingent labor or “precarious workers”) has also meant that these workers may experience a great deal of uncertainty as to how many hours they will work and when they will be called by the employers. Almost 50 percent of part-time workers receive only one week of advance notice on their schedule." Another a fairly common theme of economists writing back in the 18th and 19th centuries ranging from Adam Smith to Karl Marx was that the new factor jobs treated people as if they were cogs in a machine. "Adam Smith (1776, p. 385) cautioned against the moral effects of this process, as when he wrote: “The man whose whole life is spent in performing a few simple operations . . . generally becomes as stupid and ignorant as it is possible for a human creature to become.” Karl Marx, more well-known than Smith as a critic of industrialization, argued that the capitalist system alienates individuals from others and themselves. ... For Marx and others, it was not just that new factory jobs were dirty and dangerous. Jeffersonian encomiums aside, the pastoral life of small shop owners or yeoman farmers had not entailed particularly clean and safe work either. Instead the point was that this new work was in a deeper way unfit for humans and the process of covert coercion that forced people into these jobs and disciplined them while on the job was debasing." The key practical questions about a carbon tax include what should be taxed and how much is should be taxed. The what is fairly clear; the how much is fuzzier. But if advocates of a carbon tax could agree on the size and shape of such a tax, they could offer some interesting incentives for political wheeling and dealing. Donald Marron, Eric Toder, and Lydia Austin write about "Taxing Carbon: What, Why, and How" in a June 2015 exposition for the Tax Policy Center (which is a joint venture of Brookings and the Urban Institute). Discussions of climate change typically focus on carbon emissions, but there are other greenhouse gases (and non-gases, like soot) that also affect can trap heat in the atmosphere. Here's a list of the major greenhouse gases, and how much heat they trap relative to carbon. It's common in discussions of this subject to refer to all taxes on greenhouse gases as a "carbon tax," and to express the emissions of other gases in terms of "carbon dioxide equivalents." "[P]olicymakers must address the fact that greenhouse gases differ in their chemical and atmospheric properties. Methane, for example, traps more heat, gram-for-gram, than carbon dioxide does, but it has a shorter atmospheric lifetime. A cost-effective tax should reflect such differences, raising the tax rate for gases that are more potent and lowering it for gases that stay in the atmosphere for less time. Analysts have developed measures known as global warming potentials to make such comparisons. According to the potentials the EPA uses, methane is 21 times more potent than carbon dioxide over a century, and nitrous oxide is 310 times as potent (table 1). By those measures, a $10 per ton tax on carbon dioxide would imply a $210 per ton tax on methane and a $3,100 per ton tax on nitrous oxide." The main objective of a carbon tax is to reduce environmental damage by encouraging producers and consumers to cut back on activities that release greenhouse gases. This is its first dividend. A carbon tax can also generate a second dividend: an improvement in economic efficiency by using the resulting revenue to reduce distortionary taxes, such as those on income or payroll. ... For legislative purposes, the most important estimates are those of the Congressional scoring agencies, the Joint Committee on Taxation, and the Congressional Budget Office. In late 2013, they estimated the revenue effects of a tax on most greenhouse emissions starting at $25 per ton and increasing 2 percent faster than inflation. Scaling those estimates to CBO’s latest budget projections, they imply net revenue of about $90 billion in its first complete year and about $1.2 trillion over its first decade. In the absence of a broad, substantial price on carbon, policymakers have attempted to reduce carbon emissions through a mix of narrower policies. The Environmental Protection Agency is developing emissions standards for new and existing power plants, the Department of Transportation has expanded vehicle fuel economy standards, and the Department of Energy has expanded appliance energy efficiency standards. Tax subsidies and renewable fuel standards favor renewable and low-carbon fuels, such as wind, solar, biomass, geothermal, and nuclear, and biodiesel and electric vehicles. A sufficiently high and broad carbon tax would reduce the benefit of these policies. If policymakers contemplate such a tax, it would be appropriate to reassess these policies to see whether their benefits justify their costs. Some of those concerned about climate change won't like the policy tradeoffs I'm suggesting here. But lasting political coalitions need broad support. "Last Easter, my neighbors bought their daughter a pair of rabbits. Whether by intent or accident, one was male, one female, and we now live in a rabbit-rich world. Person less fond than I am of rabbits might even describe it a rabbit-overpopulated world. Whether a world is rich or poor in rabbits is a relative matter. Since food is essential for biological populations, we might judge the world as rabbit-rich or rabbit-poor by relating the number of rabbits to the amount of lettuce and grass (and garden flowers) available for rabbits to eat. A rabbit-rich world is a lettuce-poor world, and vice versa. The obverse of a population problem is a scarcity problem, hence a resource-allocation problem. There is only so much lettuce to go around, and it will have to be allocated somehow among the rabbits. Similarly, in an information-rich world, the wealth of information means a dearth of something else: a scarcity of whatever it is that information consumes. What information consumes is rather obvious: it consumes the attention of its recipients. Hence, a wealth of information creates a poverty of attention and a need to allocate that attention efficiently among the overabundance of information resources that might consume it. A large share of the costs of an information-rich environment are carried by information users, not information providers. "In an information-rich world, most of the cost of information is the cost incurred by the recipient. It is not enough to know how much it costs to produce and transmit information: we much also know now much it costs, I terms of scarce attention, to receive it. I have tried bringing this argument home to my friends by suggesting that they calculate how much the New York Times (or the Washington Post) costs them, including the costs of reading it. Making the calculation usually causes them some alarm, but not enough for them to cancel their subscriptions. Perhaps the benefits still outweigh the costs." Does your information-processing system listen more than it talks? "An information-processing subsystem (a computer or a new organizational unit) will reduce the net demand on the rest of the organization’s attention only if it absorbs more information previously received by others than it produces—that is, if it listens and thinks more than it speaks. ... The design principle that attention is scarce and must be preserved is very different from the principle of “the more information the better.” … The proper aim of a management information system is not to bring the manager all the information he needs, but to reorganize the manager’s environment of information so as to reduce the amount of time he must devote to receiving it." Humans may be poorly adapted to disregard information readily enough. "Our attitudes toward information reflect the culture of poverty. We were brought up on Abe Lincoln walking miles to borrow (and return!) a book and reading it by firelight. Most of us are constitutionally unable to throw a bound volume into the wastebasket. We have trouble enough disposing of magazines and newspapers. Some of us are so obsessed with the need to know that we feel compelled to read everything that falls into our hands, although the burgeoning of the mails is helping to cure us of this obsession. If these attitudes were highly functional in the world of clay tablets, scribes, and human memory; if they were at least tolerable in the world of the printing press and the cable; they are completely maladapted to the world of broadcast systems and Xerox machines." The traditional solutions to information overload still work. "Even before television, we lived in an environment of information conveyed mostly by our neighbors, including some pretty tall tales. We acquired a variety of techniques for dealing with information overload. We know that there are people who can talk faster than we can and give us an argument on almost any topic. We listen patiently, because we cannot process information fast enough to refute them; that is, until the next day, when we find the hole in their argument. A relevant rule that my father taught me was, "Never sign in the presence of a salesman." By adopting such rules and their extensions, we allow ourselves the extra processing time needed to deal with the information overload. ... I think that all levels of intelligence, human beings have common sense protecting them from the worst features of their information environment. If information overload ever really gets the best of me, my last resort is to follow the advice of Gertrude Stein in the opening pages of The Autobiography of Alice B. Toklas: `I like a view, but I like to sit with my back turned to it.'" On the economics of the eurozone, Thimann argues that the problems have microeconomic roots, not just macroeconomic ones. Here are a couple of intriguing figures. 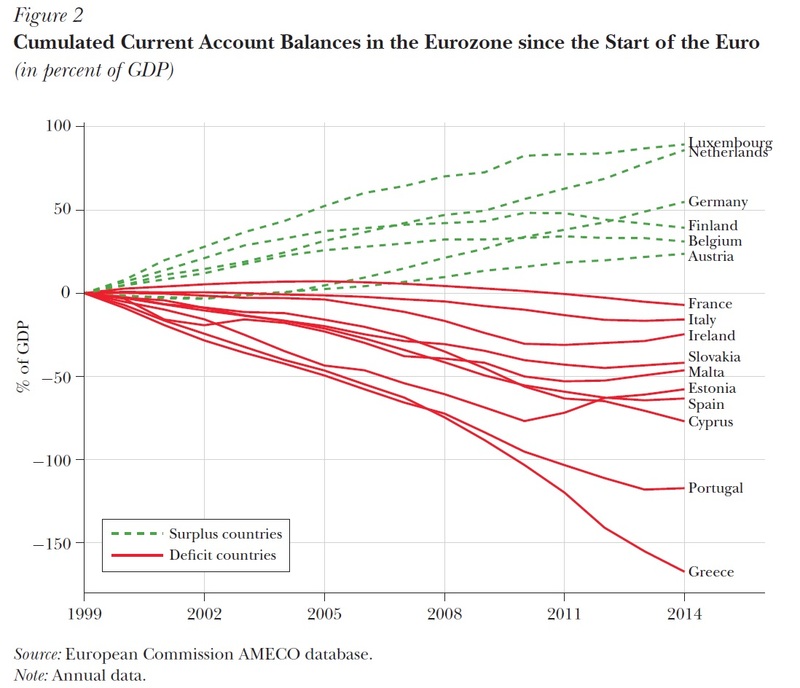 Thimann points out that since the inception of the euro, some economies have consistently run trade surpluses, while others have consistently run trade deficits. 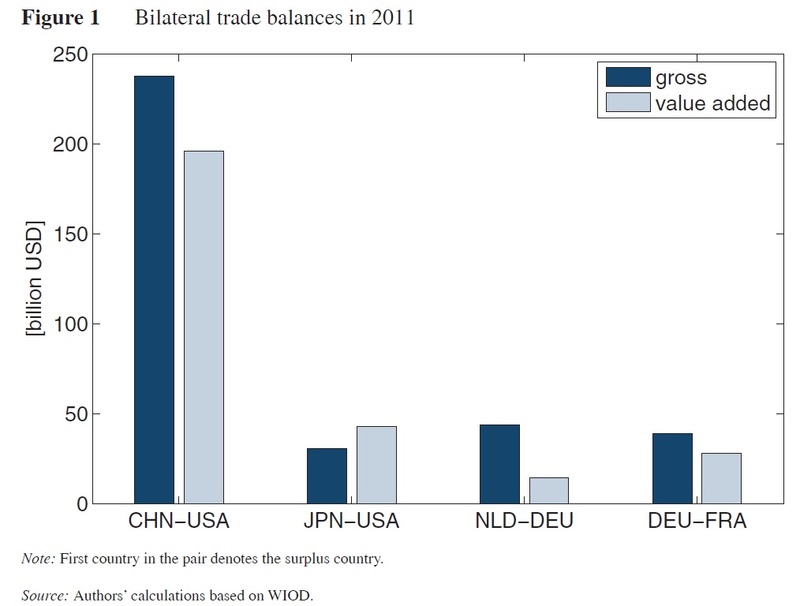 This figure shows the cumulative trade surpluses and deficits over time. What's especially interesting to me is the relative steadiness of these lines: countries with trade surpluses tend to add surpluses every year, countries with deficits tend to add deficits every year. Thimann argues that a driving factor behind these trade imbalances arises out of the interaction between wages and productivity. 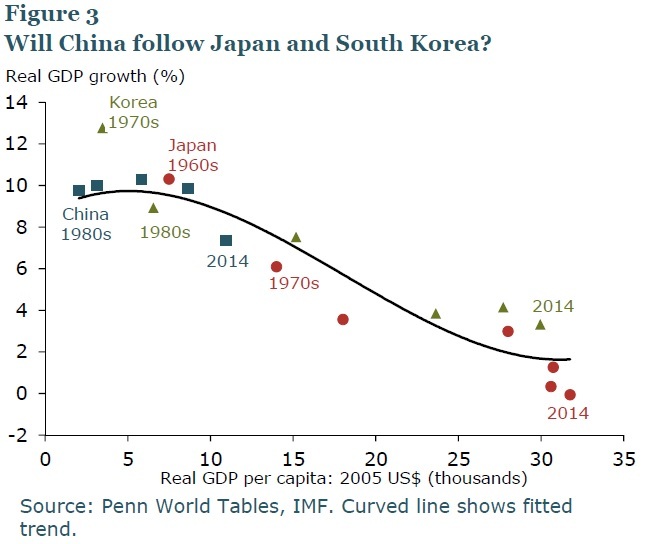 If wages in a country are growing a lot faster than productivity, then in effect, the cost of producing in that country is rising and it will be harder for that country to sell in international markets. 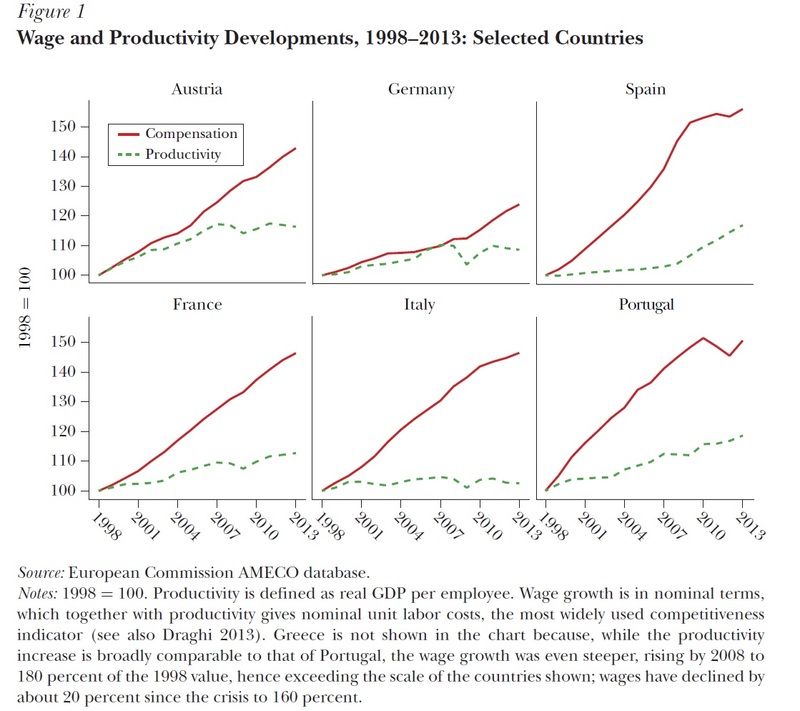 If two countries share the same currency, so that exchange rate adjustments are not possible, then a country where wages are growing much faster than productivity will be at a competitive disadvantage compared with countries where wage growth is more closely aligned with productivity growth. Thimann points out that in the the trade deficit countries, compensation soared well above productivity growth almost as soon as the euro was in place. Why is Greece not shown among the countries here? 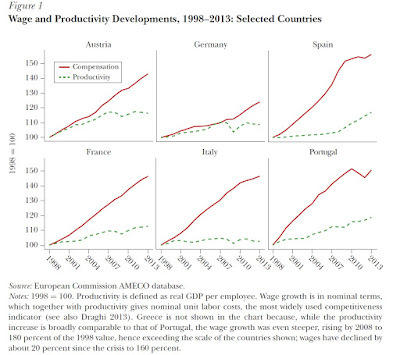 Thimann writes in the note under the table: "Greece is not shown in the chart because, while the productivity increase is broadly comparable to that of Portugal, the wage growth was even steeper, rising by 2008 to 180 percent of the 1998 value, hence exceeding the scale of the countries shown; wages have declined by about 20 percent since the crisis to 160 percent." Why did wages rise so quickly in the trade deficit countries? Some countries saw real estate bubbles or surges in government borrowing that pushed up wages in a way that productivity growth could not sustain. Public-sector wages took off: "Over the first ten years of the euro, public wages grew by 40 percent in the eurozone as a whole and by 30 percent in Germany. But public sector wages rose by 50 percent in France, 60 percent in Italy, 80 percent in Spain, 110 percent in Greece, and 120 percent in Ireland." A common justification given for the rapid wage increases was that price levels in many of the trade deficit countries were rising, often at 6-7% per year, and so there was a perceived need for wages to keep up. But for the purposes of international trade and competitiveness, what matters is the wage--not the rise in local-country prices. This is best encapsulated in an anecdote from my visit to Athens. A friend and I met up at a new bookstore and café in the centre of town, which has only been open for a month. The establishment is in the center of an area filled with bars, and the owner decided the neighborhood could use a place for people to convene and talk without having to drink alcohol and listen to loud music. After we sat down, we asked the waitress for a coffee. She thanked us for our order and immediately turned and walked out the front door. My friend explained that the owner of the bookstore/café couldn’t get a license to provide coffee. She had tried to just buy a coffee machine and give the coffee away for free, thinking that lingering patrons would boost book sales. However, giving away coffee was illegal as well. Instead, the owner had to strike a deal with a bar across the street, whereby they make the coffee and the waitress spends all day shuttling between the bar and the bookstore/café. My friend also explained to me that books could not be purchased at the bookstore, as it was after 18h and it is illegal to sell books in Greece beyond that hour. I was in a bookstore/café that could neither sell books nor make coffee. One story like this is a comedy. An economy in which stories like this are commonplace--and which is locked into a free-trade zone with countries sharing a common currency, is a tragedy waiting to happen. On the politics of the eurozone, Thimann argues that the euro, the European Central Bank, and all the European-wide negotations over debt overshadowing these other issues. Normally, when a democratic country has miserable economic performance with high unemployment and slow growth, a common response is for its citizens to demand some policy changes from their politicians. But in the euro-zone, when a country has a miserable economic performance, the politicians of that country tell the citizens that it's not their fault. 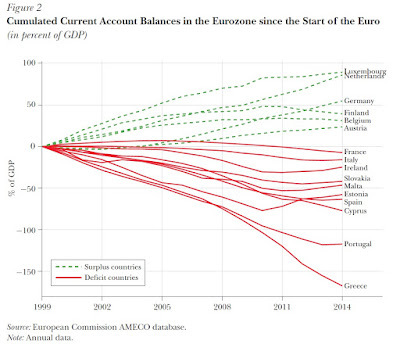 It's all the fault of the Euro-crats in Brussels, or Germans pulling strings behind the scenes, or the ECB. The politicians tell the voters that self-examination unnecessary and even counterproductive, because they to unite against the malign outsiders. It is legitimate to speak about this as a problem for the eurozone in the sense that economic policies in a single currency area are truly a matter of common concern, and also because high unemployment interferes with the smooth functioning of the eurozone, challenging its economic and political cohesion. But it is not accurate to attribute responsibility for the problem, or the solution, to the eurozone as a whole, to European institutions, or to other countries. Jobs fail to be created in a number of these countries not because of a “lack of demand” as often claimed, but mainly because wage costs are high relative to productivity, social insurance and tax burdens are heavy, and the business environment is excessively burdensome. All of this should be viewed not in absolute terms, but in relative terms, compared with other economies in Europe and countries around the world where labor costs and productivity are more advantageous, and the business environment is friendlier. For the eurozone countries, their economic and unemployment problems are not primarily a question about some countries versus other countries within the monetary union, but about finding their place in an open global economy—that is, about competing and cooperating successfully with advanced, emerging, and developing economies across the globe. An inward-looking European debate on the distribution of the relative adjustment burden for structural reforms would dramatically overlook the much broader challenges of integration into the global economy. ... It may be more glamorous to focus on European monetary policy, the “European architecture,” or the “bigger macro picture.” But the real issue of—and solution to—the crisis in the eurozone lies in the mostly microeconomic trenches of national economic, social, and structural policies. I think Thimann may understate the fundamental macroeconomic problems that are being created by the presence of the euro (as I've discussed here and here, for example). But he seems to me quite correct to emphasize that many European countries badly need structural, regulatory, and microeconomic adjustments. Moreover, politicians and voters in many of these countries would much rather assail the rest of Europe about international negotiations involving public debt and the euro, rather than face their domestic political issues.